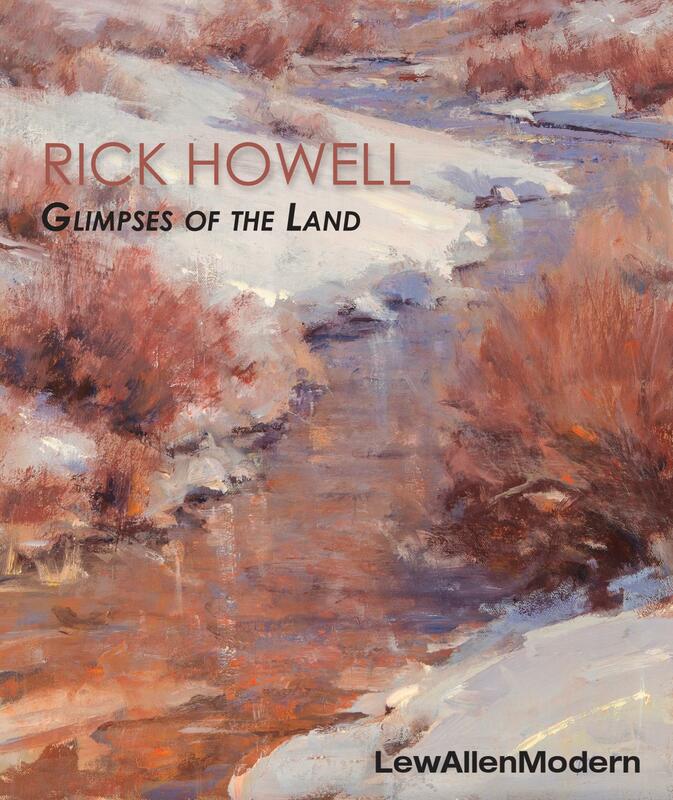 Rick Howell's landscape paintings deftly fuse the influences of the Old Masters, the American Romantic Landscape movement, and the tonal colors, loose brushwork, and softness of form displayed in the Barbizon school. Howell’s art is notable for its poetic and atmospheric interpretation of the land, as derived from his direct on-site observations and impressions. A master of light, color, and shadow, Howell creates highly ordered scenes which consciously juxtapose hazy or blurred elements with sharp and refined details. 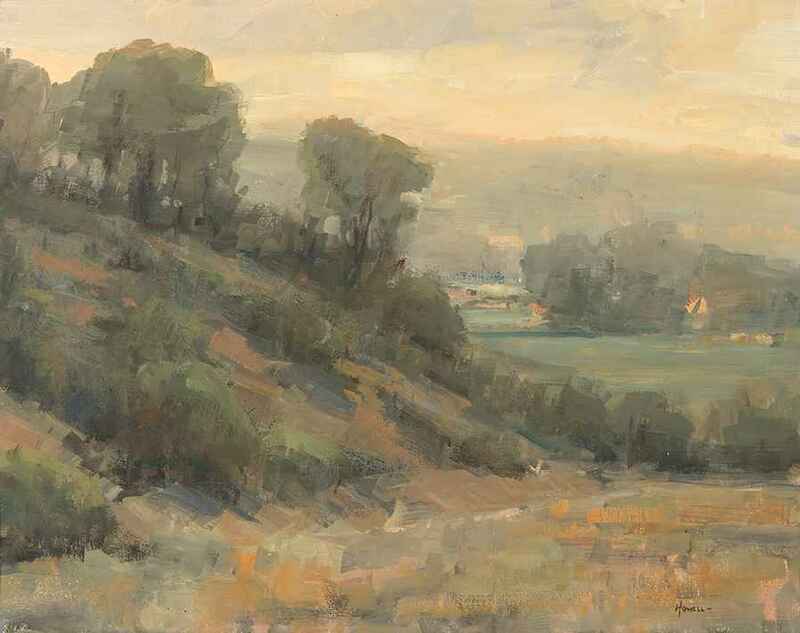 A master of the tonalist landscape, Howell often utilizes the overall tone of colored atmosphere or mist to elicit an emotional response. Howell’s work demonstrates extraordinary sensitivity to time and place, to the endless variety of forms and colors of landscape in the Southwest, and to expressing the quiet contemplative beauty of nature, capturing the nuances of place through his use of subtle gradations of color and light. Howell often painted en plein air for weeks at a time, even in harsh winter months. While Howell was neither purely a realist nor an impressionist painter, his works convey both the earthly and the ethereal to capture the full essence of a locale as observed and felt on location. As a fourth-generation native of New Mexico, Howell had a deep connection with the Southwest; in particular, he drew considerable inspiration from the wilderness that surrounded his studio at the mouth of the Conejos Canyon in the Southern San Juan Mountains, as well as the diverse adjacent terrain of the Colorado-New Mexico borderlands. Howell’s paintings engage the viewer by eliciting the emotional powers of both the visible and the invisible in a simultaneous experience. Applied in elegant gradients of light-struck hues and accomplished sensuous textures, Howell’s brushwork responds to the atmosphere and sensations of his chosen subject matter, varying from broad, dynamic gestures to lithe glimmers of gleaming color. Reflecting Howell’s desire to capture a feeling rather than relaying a mere visual reproduction, Howell’s works reverentially evoke an interweaving of both the physical and the spiritual experience of nature and landscapes. Howell had a deep relationship with nature, and his passionate involvement with the land manifests as visual record of these treasured places. Howell founded Art for Endangered Landscapes in partnership with The Nature Conservancy, in the hope of preserving the landscapes he loved to paint. With a keen eye for color, atmosphere, and shifting light, Howell’s art garnered top awards presented by the American Impressionist Society, Salon International’s International Museum of Contemporary Masters, and the Oil Painters of America. 16" x 20" Framed: 22.38" x 26.38"